Lead track ‘We Are All Going To Die’ kicks off the EP with an edgy workout; its speed and tightness suggest a melodic punk root, but the wall of sound approach to the production and deep bass draw more influence from goth and shoegaze scenes. Combined, it’s an intensive thrill ride, especially in the way the drums fill each verse with relentless machine-gun rimshots. Dig below the wall of sound and you’ll find a great melody too, something set on an uneven keel by a joyous yelp of a vocal. While the sharpness of the verses are likely to leave the strongest impression, a noisy chorus with traces of Leatherface and other indie-punks is just as cool…and by the time the whole band crank the intensity and the amps for a huge distorted finish, you might just wonder how they fit so much into a four and a half minute single. Brilliant. Keeping up the momentum, ‘Daisy! It’s The New Me’ rattles along like the most enthusiastic indie rocker, with a sheet of guitars underscored by a glorious lead bass, as if Peter Hook has sat in on a recording with an intense post-rock act. It gives the air of being more important musically than lyrically, as in places, the vocal – although quite loud – often gets swamped by the huge sounds served up by the rest of the band. For lovers of a dense guitar and numbers that take longer to unravel, with the intensity of My Bloody Valentine and the Scandinavian alt-pop quirk of Team Me fighting for dominance, this is especially captivating. Going for something slightly less claustrophobic – slightly – ‘Ghost Boy’ presents some very cool, almost glassy dreampop guitar lines during an atmospheric intro, which with help from an occasional lead bass really sets the tone. By the time the drums kick in, the steady rhythm gives a more gothic feel. 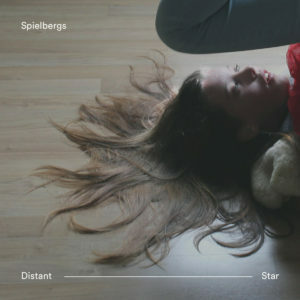 The more rigid qualities of the track help to make it one of Spielbergs’ more instant offerings, but the magic truly happens during the track’s mid section when the drums fall away to reveal a repetitive bass thud and shimmering guitars that appear to be on loan from U2’s ‘Boy’ album back in 1980. Add a hugely melodic counterpoint from keyboards that sound more like xylophones and things veer towards the truly special. With everyone coming together to build another noisy climax, there’s so much thought gone into these eight minutes. …And best of all is the fact that it doesn’t ever come across as fussy or over-complicated for the sake of it. Those looking for a catchy indie rock hook should look no further than the title track, a number which has a huge heart that pumps retro blood through every bar. Musically, there are traces of the noisier moments of the earliest Placebo and traces of the Maccabees (especially in the drum sound), but more than that, Spielbergs’ love of the multi-layered and dense sounds still has a charm of its own, while the repeated refrain of “we can be perfect, you’re gonna make me better” is as catchy as hell. Very much of the school of music that would have found a home on 4AD back in 1996, this is a warm musical hug for anyone deep into that label’s shoegaze and heavier indie sounds, before the softer and moodier ‘Setting Sun’ recycles dark electronica and pop-goth sounds for a genuinely heart-wrenching tune that’s quite close in spirit to fellow Scandinavians The Foreign Resort. Heavy pounding drums and bass with elements of feedback and a clean toned guitar set up a melody that sounds unshakable, but it’s a softer, slightly echoing lead vocal that resonates, especially when something so melodic is placed against a warped sounding keyboard. As with a couple of other tracks, its instant familiarity is a great asset, but by the time you’ve heard this number a couple of times, you’ll be convinced that, stylistically speaking, it’s one of the best examples of dark dream pop/indie ever. So much so, in fact, it blows the rest of the EP out of the water…and that’s saying something considering the quality threshold was already ridiculously high. ‘Distant Star’ covers a huge amount of ground in just under twenty five minutes and if you crave a wall of sound, or deep bass lines on a voyage into dark shoegaze, the EP will deliver time and again. The intensity served up by these three guys is amazing and their gift for making a retro sound seem insanely relevant at the time of release is almost unsurpassed. You can’t afford to miss this one. This entry was posted in Album & EP Reviews and tagged by the time it gets dark, goth, indie, norway, shoegaze, spielbergs by Real Gone. Bookmark the permalink.